Facebook stock price rebounded on the two-year low of 123.30, registered on December 21. Currently, the price holds above the 50-day simple moving average and the 23.6% Fibonacci retracement level of the downleg from 218.44 to 123.30, around 145.74. The stochastic is detecting upside momentum as the %K line posted a bullish crossover with the %D line, while the MACD is flattening in the positive zone. Further upside recovery in the stock may encounter immediate resistance near the 152.00 zone, marked by the latest highs in the prior week. An upside break of this region could open the way towards the 156.00 barrier and then at the 38.2% Fibonacci around the 160.00 psychological hurdle. On the other side, another wave of losses could stop at the 142.00 support and the 50-day SMA near 140.00. If the price edges lower, this could open the door for the two-year low of 123.30. 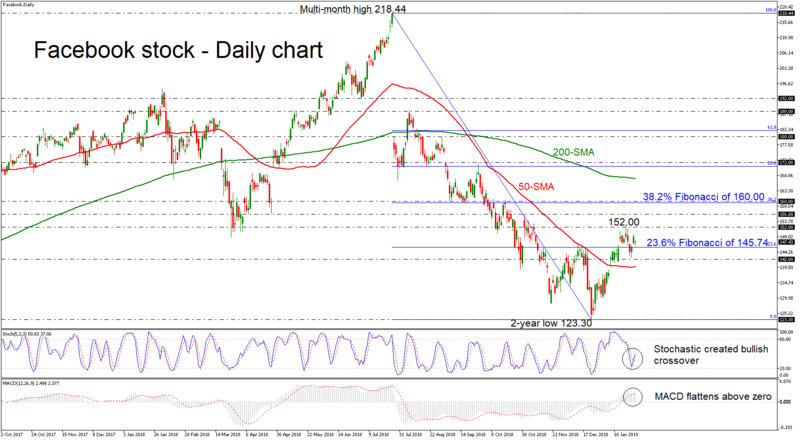 Concluding, the market remains in a negative mode in the medium term, however, in the near term, the stock seems to be ready for a bullish correction, confirmed by the technical indicators and the jump above the 50-day SMA.